Cook County Crime Stoppers provides up to $1,000 cash awards for information leading to an arrest. 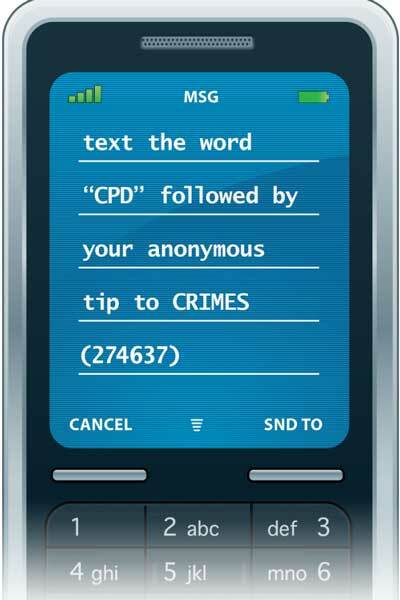 Citizens can send anonymous tips to the police Crime Prevention Information Center by text message or SMS. Enter the number 274637 (CRIMES) in the “TO” line. In the message box, type the word CPD, a space, and then the tip. Hit “Send” and you'll get an auto-generated confirmation. 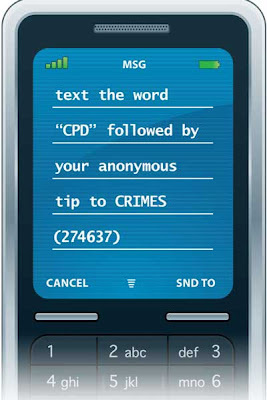 For details, check www.chicagopolice.org/txt2tip. To report crimes in progress, dial 911.